From a bird’s-eye view, the history of Chinese cinema as it has been written appears less a cumulative chronology than a series of tactical concessions. For the scholar confronted with a centrifugal field held together by no single geographical center or contiguous boundaries, cleft by the disruptions of wars both external and internal, place names—Shanghai, Hong Kong, Taiwan, the PRC—become overdetermined as points of anchoring, their specificity calling forth a sense of spatial order, even as the significance of these names shifts throughout the twentieth century. Temporal discontinuities are tamed in a similarly territorializing logic by which eras are defined by reference to ruling political entities, deriving their coherence from the latter’s projection of authority, naturalized by claims to historical agency and power. The written history of Chinese cinema thus sediments in distinctive patterns, accumulating along trajectories of establishment, stabilization, coalescence, and institutionalization—i.e., the Republican era of Shanghai filmmaking, the socialist cinema of the Seventeen Years—or around those moments when discrete political, economic, and cultural changes congeal as a legible transformation—as in the post-socialist era of mainland cinema. But what about the periods and turning points defined by other kinds of processes: political disturbances that alter the balance of geopolitical power and lead to the uprooting of populations, the unraveling of existing systems of production, the flux entailed by mass migration and movement? And what about the internal differences—linguistic, cultural, ideological—that such processes bring into visibility? These questions, raised in a number of recent notable books on Chinese cinema, are explored with exceptional critical rigor in Fiery Cinema: The Emergence of an Affective Medium in China, 1915–1945. With this study, Weihong Bao breaks from both the conventional periodization and the exclusive focus on Shanghai that largely characterize scholarship on pre-PRC Chinese filmmaking. The first part of the book takes us into the past with archival excavations of early Chinese film culture in semi-colonial Shanghai, fleshing out the scant record of this period with detailed readings of screenplays and other print records of non-surviving films. Part two turns to the left-wing film movement of the 1930s, situated at the juncture of rising nationalism in the face of the Japanese bombing of Shanghai and the technological upheavals surrounding the transition to sound film. In part three, the book extends beyond 1937 as the terminus of the commercial Shanghai film industry, to give the first in-depth account of the wartime cinema of resistance that emerged in Chongqing during the second Sino-Japanese War. Here Bao offers a vital perspective on a hitherto missing chapter in the history of Chinese cinema by tracking a set of interlocking mobilizations—the westward migration of the country’s military, commercial, and cultural forces; the expansion of cinematic exhibition into rural inland areas by mobile projection units; and the mobilization of film and mass media as instruments of propaganda in the project of national defense. The breadth and depth of the research alone distinguish the book as a benchmark for scholarship. In Fiery Cinema we find what is to date the most comprehensive, multi-faceted, and archivally substantiated account of Chinese cinema before 1945. But such a description accounts only for one part of the book’s accomplishment. Beyond its historiographical intervention, Fiery Cinema marshals the ideas of mobility, flux, instability, displacement as, on the one hand, a reflection on cinema as a new technology, and, on the other hand, a method by which to survey a complex web of discourses that shaped its practice and conception. During this period, as Bao demonstrates, cinema itself was a moving target. Not only did its identity undergo a continuous refraction as an art form of entertainment, instrument of communication, scientific object, sensory-bodily prosthesis, and political weapon; as part of a larger ensemble of new technologies, cinema also stood at the center of an intense interrogation of the very concept of medium in modern China. The crux of the book’s arguments and intellectual intervention consists in the move from a history of Chinese cinema to a critical genealogy of Chinese media theory, one that includes silent and sound film but also extends further to encompass photography, wireless technology, radio, and television. Bao constructs this genealogy with a method tuned into the Foucauldian frequency of contemporary media studies. Media are defined here not as objects with fixed boundaries and artefactual characteristics, but rather as complex assemblages (in her terminology, dispositifs) that encompass material-technological specificities, conventions, cultural practices, operational protocols, symbolic associations, infrastructures, institutions, and social fields of discourse. Bao navigates a stunningly expansive territory as she delineates these assemblages and uncovers the connections among the beginnings of the martial arts film, symbolist poetry, physics, and Bergsonian philosophy; among theories of acting, hypnotism, and early televisual technology; among early sound films, glass architecture, and theories of montage; among education, propaganda, and wireless technology. In addition to synthesizing strands from a multiplicity of historical and disciplinary domains, she sets them into motion along a temporal axis of changing circumstances and political contexts. The genealogical framework hovers at the juncture of two sets of transformations, one involving the rise of mass media in an era of technological innovation, the other involving the politicization of culture in a time of national crisis and warfare. Laying out these dispositifs as a series of “concentric centers” in the web of film culture, Fiery Cinema intercepts a line of scholarship on the material culture of Chinese modernity. For many readers, the book will call to mind Zhen Zhang’s landmark study An Amorous History of the Silver Screen with its combination of close filmic analysis and an outward zooming perspective on cinema’s position in the wider milieu of arts, entertainment, and performance. Both of these works give a vivid depiction of cinema as part of a host of novel sensory configurations with a modern cultural geography, against a dynamic background of vernacular mass culture—although Bao, it must be noted, explicitly rejects vernacular modernism as a theoretical framework. Instead, she invokes the framework of political modernism as one more attuned to the differentiated agency and objectives of specific social groups; the divisions that underlay commercial mass culture and assumed greater visibility in an increasingly politicized film culture; and the orientation of film and mass media toward collective action. Far better than the existing scholarship, Fiery Cinema systematically lays down the intellectual foundations of Chinese film theory in the early twentieth century. Bao casts a new light on familiar figures like the leftwing director Cai Chusheng, soft-film advocate Liu Na’ou, and dramatist Hong Shen by putting their ideas in dialogue with a host of lesser known names like the critic and screenwriter Zheng Boqi, the president of the Chinese Institute of Mentalism Yu Pingke, art critic and economist Gao Changhong, propaganda theorist Zhu Yingpeng, and Japanese literary scholar Kuriyagawa Hakuson. She breaks open the canon of Chinese film theory and suggests a host of new directions for further research by showing the impact of these writers on evolving conceptions of technological media. The book’s major contribution to a global history of film theory warrants a comparison with Victor Fan’s Cinema Approaching Reality, also published by the University of Minnesota Press this past spring. Readers will find many areas of dialogue between these complementary studies—for instance, in their readings of the work of Liu Na’ou and their tracing of a Bergsonian tendency in Chinese theories of spectatorship. But a striking difference also arises with regard to how each author constructs cinema as an object of theoretical inquiry. Whereas Fan frames his study in terms of a Bazinian ontology of cinema, Bao moves decisively away from considerations of ontology in order to submit the medium of cinema—indeed the very idea of medium—to a rigorous deconstruction. Fiery Cinema is divided into three parts, each describing a dispositif and period: “resonance,” “transparency,” and “agitation.” The three terms name various dimensions of what is ultimately a process of dematerialization. They underpin a conception of cinema wherein material specificities recede into the background, dissolving into dynamic circuits that link technologies and bodies. Bao describes cinema not in the objective sense of an apparatus, but rather in terms of an enveloping, mediating environment capable of provoking perception, reconstructing subjectivity, and stimulating collective action. She shows how such a conception came into being with the interplay of new technologies within a larger network of mass media. The parameters of cinema were “amorphous” and “imponderable,” morphing and expanding, constantly shifting with respect to other media. This definitional instability reflects a “medium consciousness” founded on a sense of convertibility and transferences across disparate media of reproduction and transmission. In this setting, the very question of what constituted a medium—a technological arrangement, the spectator’s body, the physical forces and intangible energies of nature—was far from settled. During this era, cinema was an “affective medium”; its cultural impact and historical significance resided in the shared social spaces created by its technological networks, spaces for the transference of feeling and energy, in which reconfigured relationships among bodies, matter, and technology forged alternative social perceptions that could effect political change. The book elaborates on fire as a trope of cinema’s affective power and material ephemerality. Its introduction and six chapters are threaded together by a series of fiery moments that anchor the transformations of cinema from the semi-colonial to wartime period. The first chapter begins by discussing “fiery films” from 1927-31, years that saw a proliferation of huoshao pian, martial arts action films featuring conflagrant spectacular effects. Contravening the genre’s longstanding association with popular folk mythology and archaic superstition—an association forged in its own time and perpetuated in contemporary criticism—Bao documents the roots of the martial arts picture in the contemporaneous spheres of arts, philosophy, and science. Huoshao pian were the product of intermedial and transcultural interactions among the local film industry, modern stage drama, and Hollywood popular action films. They also took shape in an intellectual climate heavily influenced by the philosophy of Henri Bergson and wave theory in the physical sciences. In tracing the circulation of these cultural discourses across the realms of mass culture and high modernist aesthetics, the chapter lays the ground for the emergence of not only a film genre, but also a conception of cinema as a medium capable of awakening the viewer’s inner life and, concomitantly, of spectatorship as gongming/resonance, as a process of stirring vibrations and arousing empathetic responses. In this context, fire comes to the fore as a metaphor for arousal, transferences of energy, and the transformation of vital forces into action. The idea of resonant spectatorship, Bao argues in chapter 2, took shape in the context of a broader social network of technological media; as an intermedial concept, it was elaborated with respect to cinema, radio, wireless communication, photography, and especially television. The discoveries of physics and thermodynamics—waves, vibrations, and electromagnetic signals—did not merely provide a scientific basis for new media technologies, but also informed ways of conceiving the spectators of these technologies. In the cultural reception of new technology, the principle of gongming was brought to bear on a new understanding of the body itself as a vibrating medium, as a receptive node within an encompassing space of “electric fire.” Bao demonstrates how body and medium are interwoven in “a new cultural sensibility of technologically produced receptivity” by synthesizing an enormous array of vernacular-scientific print materials. The model of the resonant spectator appeared in popular science journals that presented the viewing body as a tuning mechanism, completing the circuit of transmission in early electromagnetic televisions. It also flows throughout the occult discourses that arose in parallel with popular science and built to an explosion of spiritualist and parapsychology clubs in the 1920s. In manuals on hypnotism and telepathy, Bao identifies a proto-media theory that envisions the body as device for projecting images across distance, much like photography and cinema, and explains unfamiliar technologies of transmission like television in terms of psychic phenomena. Meanwhile, the hypnotic subject makes a surprising appearance in theories of acting, invoked by Hong Shen as a desired condition for the actor, whose craft entails the cultivation of susceptibility to external influence, for the sake of projecting one’s body in another’s place. In this ideal of sympathy as a form of productive heightened receptivity and amenability to physical transformation, we find a convergence of acting and spectatorship as resonant practices. The next two chapters move forward to the 1930s, considering the transformations wrought by the introduction of sound technology in tandem with the politicization of the film world in the wake of the bombing of Shanghai in 1932. Chapter 3 turns to one of the signal developments of the decade, the leftwing film movement, discussing key members such as director Cai Chusheng and the writers Tian Han, Xia Yan, and Zheng Boqi. Closely analyzing their work, Bao paints a detailed portrait of leftwing cinema as a radical movement that marshaled the tenets of modernist aesthetics toward the ends of mass politics. Against prevailing characterizations of the movement as concerned with content rather than form, Bao argues that the very politicality of leftwing cinema consisted in its participation in critical debates about film form and medium specificity arising in the mid-1920s. By engaging with international and domestic discourse of film theory, by selectively transforming popular filmmaking conventions, the leftwing film movement forged a “medium-conscious aesthetic” that aimed to mobilize “mass affect and perception” in the project of cultivating a class-conscious, nationalist subject. These arguments are borne out by close analyses of the screenplays for the lost films Dances with Fire and Torrent—the latter part of a cycle of films depicting the destructive revolutionary force of the crowd—and the early sound film New Woman as an example of how the aesthetic experiment with sound was central to the creation of a politicized cinema. Chapter 4 forges a dialogue between cinema and architecture around the idea of perceptual transparency—as a property of a modern building material, on the one hand, and as a promise of new technology, on the other. It sets out the historical significance of transparency with a description of the introduction of glass architecture to Shanghai, used in luxurious homes, movie theaters, teahouses, brothels, department store windows, and dance hall floors. Plate glass was a crucial material component of a consumer culture of intoxicating display and surface attractions. Consequently its status as a modern perceptual medium comes to inflect critical debates in the film world as an analogy for cinema. The analogy gains traction in discussions of montage, where we find the relationship between film and glass architecture invoked by both Chinese writers like Feng Zikai and Soviet theorists like Eisenstein and Pudovkin, whose works circulated in Chinese translations during this period. The analogy also brings to light the underlying political stakes of the discourse around the new medium of sound cinema. Through a close engagement with critical reflections on the coming of sound and through analysis of the leftist experimental sound film Scenes of City Life, Bao shows how the concept of transparency underwent a transformation in the hands of leftwing filmmakers seeking to shatter the surfaces of consumerist display with a penetrating political vision. The final two chapters of the book take up what Bao terms the “methodological challenge” posed by the highly politicized mass culture of the wartime era. With the invasion of Shanghai and the relocation of the Nationalist government to Chongqing came a reorientation of cinema toward national defense and the explicit aim of propaganda. Yet the turn to propaganda marks not a rupture from an earlier era of entertainment, but rather a continuation in a new key of the media aesthetics and spectatorial modes of prewar cinema. Thus in the post-1937 cinema of agitation, the earlier dispositifs of resonance and transparency return with a charged significance. Chapter 5 sets the stage for this discussion with a spatio-temporal mapping of the Marco Polo Bridge Incident, the event that marked the beginning of the Second Sino-Japanese War. As the event reverberated through Chinese media—relayed in news reportage and newsreels, mediated in poetry and spoken drama—it “initiated a national experience of the intensity of now” and launched the “singular time” of the War of Resistance. The westward migration through the hinterlands to Chongqing entailed a massive diffusion of these networks through space, penetrating regions beyond the urban center of Shanghai and reaching the rural masses. The geographic relocation of the center of power and cultural production contributed to the synchronization of the country within a singular time of emergency. Yet it also raised questions of how to reach new audiences composed of diverse demographics and identities, thus provoking reconsiderations of film and its aesthetics. In this context, wireless technology emerged as a master metaphor—for a radiating media network that aspired to instantaneity and coverage, also for the power of propaganda as a crucial instrument in a “war of nerves” waged both on land and in the ether. Along these lines, cinema too was reconceived as a “mobile art leaping in the air,” refitted as such by means of mobile projection units and multimedia formats of exhibition. 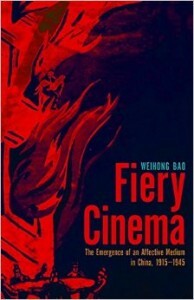 Fiery Cinema is a milestone achievement of scholarship, erudite and brimming with original insights. The scope of its disciplinary interventions is sweeping, and the intellectual boldness with which it traverses its terrain is bracing. Bao absorbs resonance as a method of exposition, building up dispositifs layer by layer, tracking their echoes and permutations across different contexts, moving outward in concentric circles while referring back to core concepts. At times the book buckles under the weight of these concepts and the intricacy of the theoretical web it spins; these moments are triggered to a large extent by citations that weigh the argument down instead of propelling it along. The invocation of affect might provoke an anticipation of a dialogue with affect theory that ultimately doesn’t happen—and that the book in no way needs, given the historical specificity of the phenomena it designates by this term. Ultimately it is to Bao’s credit to have written a book that will not yield its insights to a single beginning-to-end reading. Fiery Cinema demands multiple encounters and readings, and its insights will reverberate in the field of Chinese film and media studies for years to come. See Jeremy Taylor, Rethinking Transnational Chinese Cinemas: The Amoy-Dialect Film Industry in Cold War Asia (New York: Routledge, 2011) and Victor Fan, Cinema Approaching Reality: Locating Chinese Film Theory (Minneapolis: University of Minnesota Press, 2015). Zhang Zhen, An Amorous History of the Silver Screen: Shanghai Cinema, 1896–1937 (Chicago: University of Chicago Press, 2005).